Hours before the show was set to begin, the buzz in downtown Montreal began to amplify, as the KISS Army shuffled toward the Bell Centre to catch the iconic rock band, a stop on the band's "End of the Road" farewell tour. Hundreds if not thousands of fans painted their faces like their favourite band members, or dressed up in full-fledged costumes. Many parents brought their kids in tow, friends and families laughing, sticking out their tongues and excitedly taking pictures before the show. Other fans pounded beers and reminisced about past KISS tours, and the number of times they had seen the band live; by the time the show was set to start, fans packed the arena to the very rafters. With an eruption of explosions and pyrotechnics, the massive screen in front of the stage collapsed, revealing the four band members descending to the stage on massive floating platforms, belting out the riffs to "Detroit Rock City" while the crowd howled ecstatically. The band were adorned in costumes like superhero rock stars from another planet — they wore their capes, vests, signature face makeup and wielded some of the most insane platform boots the world has possibly ever seen. Every aspect of the wardrobe, stage and their instruments were obscenely awesome, like a tornado of magical glitter, spikes, leather and lasers has descended on the arena. 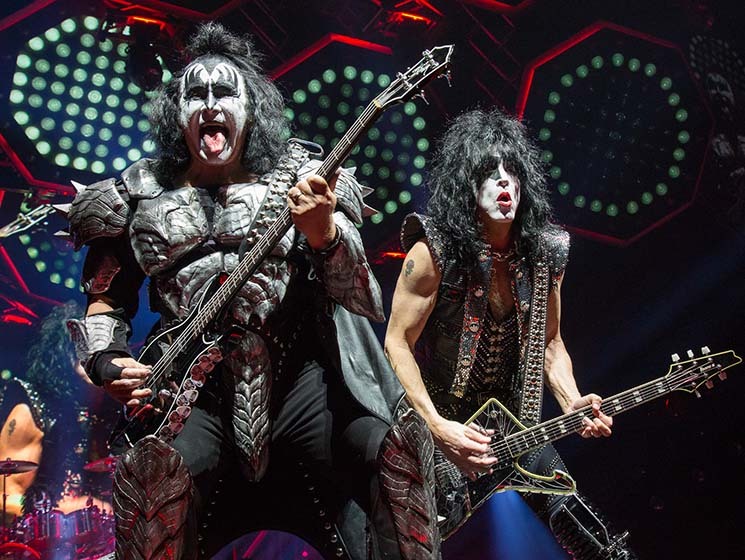 The band members/alter-egos Paul Stanley (The Starchild), Gene Simmons (The Demon), Eric Singer (The Catman) and Tommy Thayer (The Spaceman) flexed their near-50-year band history and 24 albums worth of material into a very well-crafted farewell performance. And while many fans may have hoped original member and lead guitarist Ace Frehley would join the band in some capacity this tour, it simply didn't happen. So after powering through the first two songs of their set, the band paused and lead singer/guitarist Paul Stanley took a moment to chat with the crowd, reflecting on one of his favourite shows at the iconic Montreal Forum in 1977. He then spent at least two minutes pointing into different parts of the arena, encouraging fans to see which section could scream the loudest. The band dove into a carefully curated set, playing about 20 signature tracks from 12 different albums, careening through the time and space of their catalogue. Sometimes anchored at key positions at the stage, at other times moving to meet each other to interact, the band delivered vintage KISS tracks such as "Shout It Out Loud," "Heaven's on Fire," "Black Diamond" and "Psycho Circus." A mid-set performance of "Cold Gin" from their 1974 self-titled album had the crowd howling at peak levels, as did a stellar performance of their 1983 rock anthem "Lick It Up." The stage was impressive, like some sort of alien fortress, pulsating and throbbing with colour. The ceiling of the stage was provided by 12 massive floating discs that would move in unison, flip, sway and display video. The discs also made for good target practice; during guitarist Tommy Thayer's solo, he would shred a pile of riffs, and then pause to launch a pyro-rocket out of his guitar and "blow up" one of the discs. It was incredible to watch him solo and systematically destroy a bunch of the stage in such a cunning way, and it had the crowd going insane. Singer/bassist Gene Simmons had numerous signature moments as well. Between prowling the stage, pointing into the crowd and flashing his tongue about a thousand times, it was especially impressive during his bass solo when he "bit" his own tongue, sending blood gushing down his face. Continuing to wail away, he was lifted by a massive platform that rose until he was almost hitting the top of the arena, where he led the band in delivering an impressive rendition of "God of Thunder" from their 1976 album Destroyer. The show seemed to get better and more insane with every passing song. Near the end of the first set, Paul Stanley moved to a large circular platform on the floor at the opposite end of the arena, dancing and delivering terrific renditions of "Love Gun" and then their epic disco-rock classic "I Was Made for Lovin' You," while a giant disco ball illuminated the arena in spinning white reflective light. The encore saw drummer Eric Singer take to a piano that rose out from beneath the stage so he could deliver an excellent rendition of the band's 1976 ballad "Beth." It was the final performance of the night, however, that absolutely stole the show, as KISS took to the stage (and the air) to perform their biggest hit "Rock and Roll All Nite" from their vintage 1975 album Dressed to Kill. While the other two members remained firmly planted on the main stage, Gene Simmons and Tommy Thayer hopped onto these floating discs controlled by gigantic robotic arms that had them extended way up in the air and out into the crowd, moving past fans sitting in the sides of the arena. It's definitely amazing to see a floating Gene Simmons, wagging his tongue and drooling, hammering out bass riffs floating in the air just a few feet in front of your face. Epic performance and epic production work. It was a night of countless highlights, a band and their fans having a great time, basking in their love of rock'n'roll. It was probably not possible to cram in much more laser, pyro, props and production gimmicks. The music was excellent and the fans devoured every last second of it. Before leaving the stage for the final time, the band stood at the edge, gazing out into a sea of thousand of screaming fans, absorbing the last fleeting moments while it still lasted. "Montreal did you have a good time?" Stanley asked the crowd. "You know we love you! Good night!"